I went to Fortitude Valley or known to locals as 'the Valley,' with Mum today. The Valley is different during the day to what it is like with all the night life. We started off by having lunch, a cheap but tasty chicken burger form Rick's Cafe and Bar, a place that also turns into a great bar at night. But during the day the Valley is a great place for shopping from Lifeline to the fashionable boutiques. And today I found on the corner of Brunswick and Wickham - Cie Espresso and Waffle Bar - where for $6.50 you can get a regular takeaway coffee and a waffle of your choice. Deliciously warm, the waffles come in many different flavors from apple and cinnamon to cookie dough. And the coffee is strong and creamy textured. The perfect thing to grab on a Winter's afternoon. 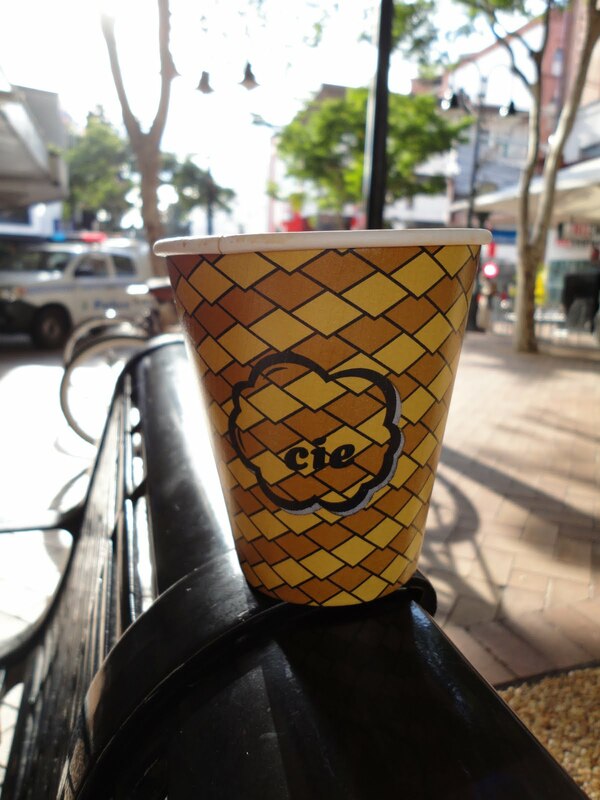 Cie has only been open for two months, but here is hoping they are going to be popping up all over the Brisbane CBD as well. Mum and I sat down (waffle and coffee in tow) listening to some good old favorites coming from a nearby busker. What a great voice he had. A great end to the perfect afternoon but I think I'll come back soon for the Valley Markets which are on Friday, Saturday and Sunday. Brunswick Street is very busy with pedestrians then.